The Panhandle Pubic Health District (PPHD) is ‘walking the talk’ regarding the link between sedentary lifestyles and poor health. This past week they awarded employees at the Northwest Community Action Partnership with a tool to keep them healthier while they see to the needs of their community: a TrekDesk Treadmill Desk. 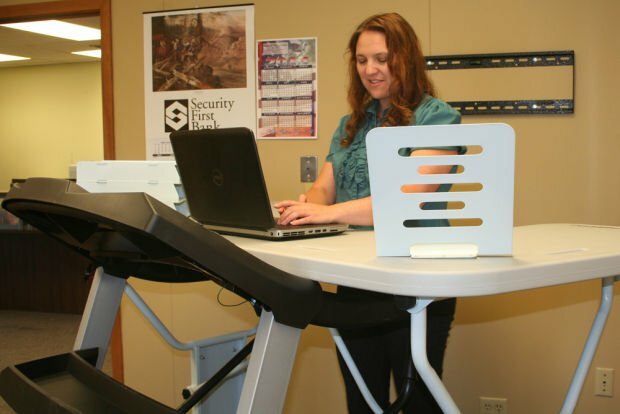 This is the fourth site to receive TrekDesk Treadmill Desks according to an article in the Rapid City Journal. Currently NCAP, PPHD, Box Butte General Hospital and the Panhandle Co-op all are using TrekDesks to improve the health and productivity of their employees. Betsy Diehl is mentioned in the article as one of the first employees to try out the TrekDesk at NCAP and found it very easy right from the start. PPHD is distributing the TrekDesks to assist in their goal of assisting employees with weight loss, improvement in blood lipid and cholesterol levels, as well as reducing stress & absenteeism and increasing productivity. NCAP is a community benefit agency formed in 1965 to carry out the goals of Title II of the Federal Economics Opportunity Act (1964), one of nine Community Action Agencies in Nebraska. Their mission is to help low-income families and individuals to improve the quality of their lives and attain self sufficiency.